“Big Jerry was a husky fellow about six feet tall, broad-shouldered, with brown eyes and brown hair and moustache. He wore ordinary work clothes and high rubber boots. He was very good-natured and always had a joke to tell about some other fisherman. His camp was at El Pozo, toward the western end of the Island.” [1980: 85]. Big Jerry cheated death in 1904 when the vessel Glendale sank at Anacapa Island. However, he came to death by accidental drowning twenty years later between Scorpion and Potato Bay on Santa Cruz Island’s east end during a severe February northwester. He and Isaac Newton had gone to look for missing fellow fisherman, Frank Nidever, aboard Shively's O.K. In their search for Nidever, the O.K. was smashed to pieces near Scorpion Rock. Both Shively, 56, and Newton, 39, were drowned. A coroner’s inquest was held on February 26, 1923, and testimony was presented by Sheriff James Ross, Dr. Charles S. Stevens, and fellow fishermen Frank Larco, Clarence Libbey, Augustine Nozeti [Noceti], Ira K. Eaton, and others. Eaton testified that accident area was “one of the worst corners on the island when a northwester is blowing. It's a regular little trap.” Shively’s body was found near Scorpion Bay at the east end of Santa Cruz Island. 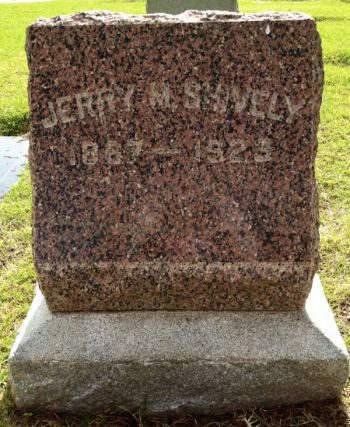 Captain “Big Jerry” Shively is buried in Santa Barbara Cemetery, Ocean View Section, Grave 1071. February 23, 1923 [SBMP]: “Newton inquiry brings no clue. February 24, 1923 [SBMP]: “Huge coast rum-drug ring vendetta may be solution to channel death mystery. February 25, 1923 [SBMP]: “Search to be made for seamen. February 27, 1923 [SBMP]: “’Jerry’ Shively’s death result of drowning is verdict. This page was last edited on 6 June 2018, at 08:55.